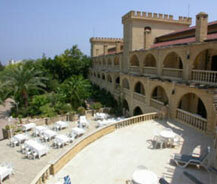 The Chateau hotel is situated in the lands of Lapethos which is known as Lambousa. This is one of the richest in the nine kingdoms of Cyprus and also this is the most powerful kingdom during that time. This hotel is also known as Chateau Lambousa Hotel and as it is situated on the island it has an elegant view of Mediterranean Sea and the Besparmak Mountain. Also this is one of the finest hotels in the eastern Mediterranean with its look and stylish suites of the hotel. This hotel has other features like an open air pool with separate sections for children's, a snack bar and sun loungers which is available at extra cost. Also it includes massaging center, a sauna which is available at extra cost and payable at the time of treatment. The rooms include all features such as air conditioned, satellite TV, bathrooms with shower, separate telephone lines, hair dryer, heater, mini bar, fridge and balcony. The rooms contain double bed and a king-size bed as per the visitor's wish. Other than this it also includes bars and restaurants in a different style when compared to other cuisines. All these features makes the people to visit this without absence during each holidays and if you are in a plan to visit any holiday spot then visit this and have a happy stay at this Chateau Hotel.